Meet Miss Joyce A la Choice! 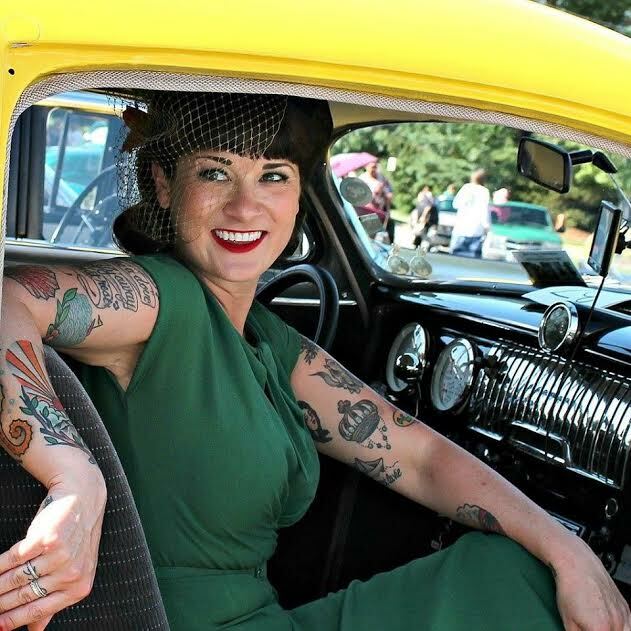 I recently had a chance to catch up with Miss Joyce A la Choice the current Miss Jalopy Fest! She is ah-mazing! I don't want to let too much out of the bag but I'm really wowed by the answers in this interview - I'm definitely inspired and encouraged to achieve even more than I thought was possible. Read on to let Joyce A la Choice inspire and encourage you! 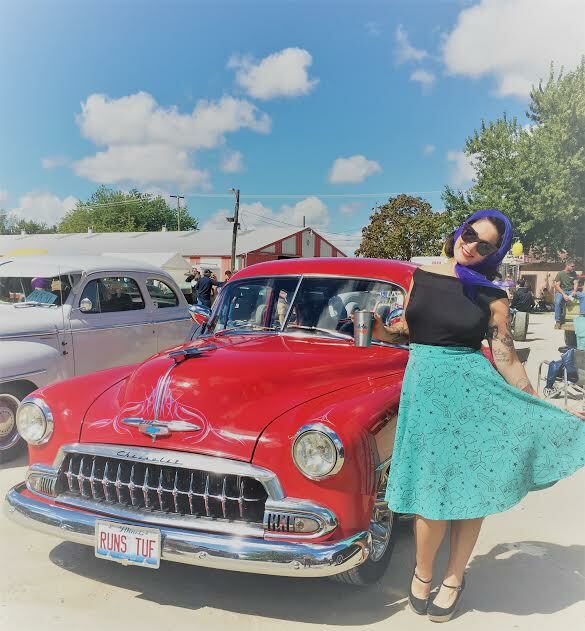 Check out her interview to get to know this amazing pinup, learn about her awesome adventures, and see why she is a pinup extraordinaire! Hey-yea, my name is Diane Joyce Mack. Pinup name is Joyce A La Choice ;). I am a self-proclaimed, “Pin-up Princess from the South Side of Chicago with style and grace.” I have been doing pin up contests for around 3 years and learn something new in each contest. Along with pinup contests, I enjoy swing dancing at all of the amazing venues in Chicago. I just did my first photo shoot with Roy Varga last summer and loved it. I currently sling drinks at one of the oldest Lithuanian bars on the Southside, Bernice’s Tavern. Also, alongside my handsome husband and my talented jazz musician brother-in-law, we are remodeling our 1892 “workingman cottage” home in Bridgeport and running an AIRBNB out of it. When we are not traveling, working on the house, or receiving guests, my husband and I love riding our bikes around the city, swimming in Lake Michigan, trying new foods, reading, and spending time with friends and fam. I also have the two cutest cats this side of the Mississippi and can make a blueberry pie that you can write home about. Is this your first contest and if not, what was different or unique compared to other contests? What was your favorite part? 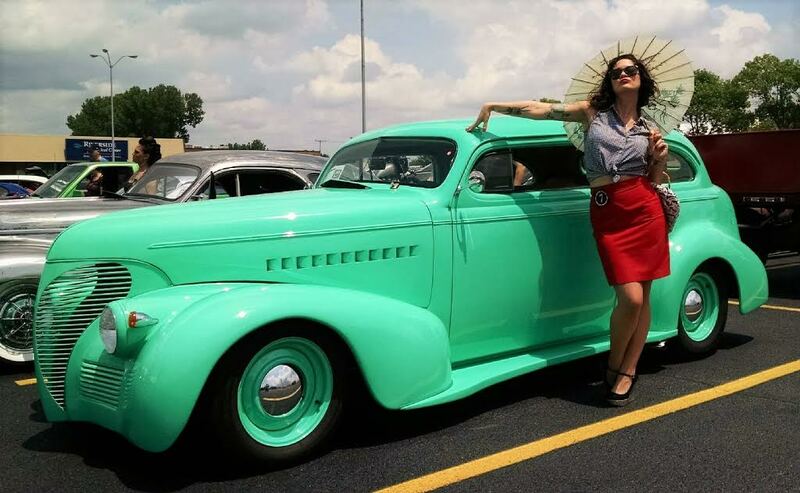 The Jalopy Fest pin-up contest is now the 8th contest that I have been a part of, whew! The Jalopy Fest was unique because of the prizes awarded to the contestants and since it was close to Chicago; I usually have to go out of state for contests. The prizes were amazing, the best that I have ever received. Since the contest was so close, my favorite part was having my husband and friends be able to come support me and to be able to celebrate with them afterwards, it was a lot of fun. I feel like I should say a rockabilly or swing band, and I do really love that music and have seen the Fat Babies play all over the city (so I was super excited that they were playing at Jalopy Fest). However, on the daily, my inner teenage dreamer comes out and I listen to Death Cab for Cutie, She and Him, Belle and Sebastian, Mates of State, etc. Also, to help be exposed to different kinds of music, I listen to 8 tracks, a music app where you select your mood and it cultivates a playlist for you. I must say that one of my favorite parts of pin-up contests are all the vintage cars at the shows. I love the style, the colors, the work that so many people put into them, they are pieces of art, really. If I had the money and a garage, I would buy a 1957 Chevy Bel Air in sky blue to cruise the streets of Chicago in. My inspiration is my grandma on my father’s side. My other grandparents passed away before I was born so my grandma was very important to me and I was close to her. My grandma had five children and always wanted to name one of them Diane. After having 4 boys, she finally had a girl but named her Michelle after a nurse that helped her, so 20 years later, my father gave my grandma her wish and named me Diane, so I always feel connected to her. I have this picture of her and my grandpa on the sidewalk and they are all dressed up and they just look so classic and stylish, I think that is the picture that inspired me to do pinup. After she passed away when I was 18, I received some of her accessories that I still wear to pinup contest, to carry her with me. Extraordinary sounds so magnificent and sometimes intimidating, but I feel that anyone can do it by just being themselves; really listening to your heart and your gut. It’s not easy all the time, it can be frightening and sometimes lonely, but the experience is worth more than one can imagine. At 21 I left my family, friends and everything I knew to travel the world, something I knew I wanted to do since I was 17. I went to a school in Australia for a year then 2 years in a small town in Central China learning Chinese (I can now speak mandarin). I have visited 15 countries including Egypt, India, Romania, Denmark, Thailand, Germany, Mexico and most recently Honduras. I have traveled all over the States form the East coast to the West. I moved back home to Chicago at 25 and wanted to finish my bachelors degree, so I moved down to the south side, got a job and worked my tail off to finish my degree from UIC. I feel like it is really important to challenge yourself with things that may frighten you, to stand on a ledge of unknown, be scared and jump anyways. To find out who you are and what you are made of; and have the courage to change. I have seen the red sun rising on mornings in China, rode with a moped gang on Lower Wacker drive in Chicago, been stung by a school of jellyfish in the ocean off of Australia. 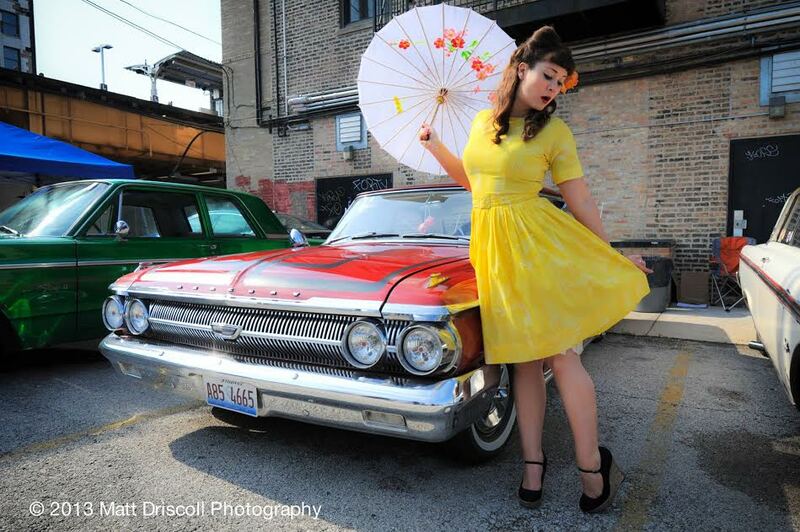 When I moved to Chicago I started swing dancing for fun and then decided that I would try participating in a pinup contest to see if I could. Robert Frost got it right, take the road less traveled-it WILL make all the difference. 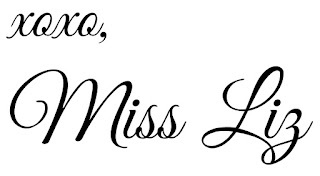 One more thing, ladies, let’s get to know each other, we are all in this together, I have learned something new at every contest that I have been in and have met some awesome women along the way. The world is tough enough, let’s not tear each other down, but be there for each other. Wow! What an inspiring pinup! Check out her fanpage for more updates and awesomeness!